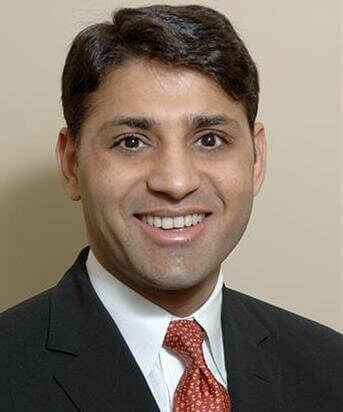 Reviewed by Rocket Lawyer On Call Attorney Dinesh Singhal, Esq. Independent Contractor Agreements are simple to make and are a way of clearly outlining the scope of the work, payment schedules and deadline expectations of a freelance arrangement. Our templates also include a confidentiality agreement, insurance expectations and an indemnification clause. You are an independent or freelance contractor and need to provide a contract for your client. 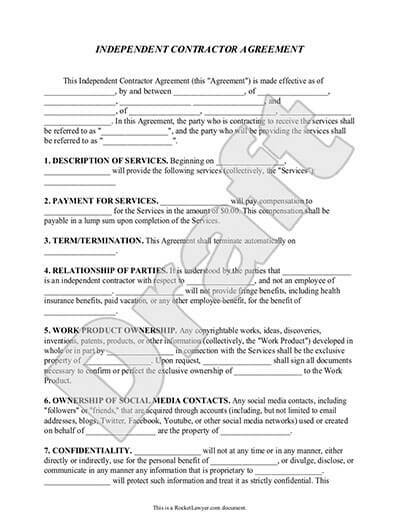 You are working with an independent contractor and need your agreements outlined in a contract. While Independent Contractor Contracts include numerous clauses and agreements, they are quite easy to make using Rocket Lawyer's document interview. It only takes a few minutes to create a legal, working contract. The first distinction that needs to be made about these contracts is that they are not for employees. There are to create an agreement between you (or your company) and an independent or freelance worker. Some examples include you paying a handyman to install new windows in your home, or you are commissioning a freelance web designer to create your company's website, or you are contracting with a painter to paint your new offices. They are independent workers and since they are not employees, the freelancer is responsible for most of their own tax obligations. Additionally, since they are not employees you cannot restrict them from taking on other clients, tell them exactly how to do their job, or dictate their day-to-day schedule. Why do I need an Independent Contractor Agreement? The first is that they help protect your business interests. The contract outlines exactly what work needs to be completed, when it needs to be finished by and how much you are going to pay. The second is that it shields you from liability issues and helps protect your assets and proprietary information. If you are taken to court, you have the signed agreement to clearly show the judge what your expectations were. You may also need a copy of the contract if you are audited by the IRS. If you are a freelancer, it can help you get paid should you end up in a payment disagreement. You'll look professional if you provide a contract for your clients if they do not have one. It also shows that you are willing to commit to work and time agreements. What are my IRS obligations if I hire an independent contractor? If the person you are contracting to do work for you is a self-employed person you will need to have them complete a Form W-9 and you'll need to fill out a 1099-MISC, both forms can easily be downloaded from the IRS website. The W-9 is to gather their contact information and tax identification number. The 1099-MISC is how they report income on their individual income tax return. You are required to do this if you pay them more than $600 within a year. To satisfy your IRS obligation, you'll have to send the completed 1099 Form to the IRS and the contract worker before January 31st of the following year. For added IRS protection, you'll want to keep for your record documents that can prove the person was a contract worker and not an employee. The burden of proof is on you to prove this, the IRS usually will assume the person was an employee unless you can prove otherwise. If you get audited you'll want on hand the freelance contract, a list of the contractor's qualifications, and all invoices and proof of payments. If you are unsure whether the contractor you are working with would qualify as an employee or independent contractor to the IRS, you can make a request for determination by filing a Form SS-8. It is easier than ever to find freelance workers for nearly any type of project. There are numerous online resources for finding contract workers for technical gigs such as app building, website creation and content writing. You can also find online connections to people to do onsite jobs such as lawn care, home repair or dog walking. An advantage to using an online or staffing service is that they often take care of most of the paperwork for you. If you are using an online site for finding a freelance worker, you can read reviews from people who have hired them before. Plus, it is advised that you ask to see their portfolio and review their online presence. Many test a freelancer's skills with a small paid project before contracting with them for a large project. If you can, meet them in-person and discuss your project. If you cannot meet them in-person, set up a phone or video call for a quick interview. If they do not have the information required to fill out a W-9, you may want to hold off working with them until they can obtain a valid Taxpayer Identification Number. If you choose to work with an independent contractor and they do well, it is helpful if you return the favor by leaving them good reviews on their online profiles or professional social media pages. You could also refer them to your colleagues if they need similar work done. It is helpful to network with good freelancers since they may have connections to other talent you may need to help you with future projects. And positive reviews about their project experience with you can help foster beneficial future business relationships. If you are running your own company, we offer numerous Essential Documents for Running a Business that can help you do things like make a Joint Venture Agreement, Business Proposal or Confidentiality Agreement. If you are an independent contractor or consultant, we provide useful documents such as Bid Forms, Consulting Agreements, Contract Extension Agreements, and more. Our step-by-step interview process makes creating a printable Independent Contractor Agreement easy.